Energy4me going back to school in Ecuador! In the rocky depths of the nation’s shale oil fields, thousands of feet below the production frenzy, primordial bacteria subsist on the very hydrocarbons that make up oil and gas and have transformed the U.S. into an energy powerhouse rivaling Saudi Arabia and Russia. The microbes are among the least-studied life forms on earth, emerging to the surface as anonymous organisms thought to have evolved within the harsh extremes of the subsurface over hundreds of millions of years. Oil and gas producers for decades paid them limited attention — until a cutting-edge startup recognized their potential to help produce oil and gas even more efficiently. Now, as industry competition intensifies, a growing number of producers have partnered with Biota, a startup developing the means of achieving that goal by analyzing the bacteria that emerge from the wellhead. More than 20 producers in the Permian Basin and elsewhere have shipped rock and fluid samples to the company’s San Diego lab, intrigued by the promise of data that could help them drill more precisely, lower production costs and boost profits. Think of it as biotechnology meets petroleum engineering. Unique microbial colonies reside within the various layers, cracks and faults in any given oil basin, making it possible to discern the boundaries of deep underground formations by analyzing the DNA of the bacteria within them. In the Permian, for example, bacteria in two overlapping layers — the Bone Spring and the Wolfcamp — are biologically distinct, providing markers that could determine whether a well is drawing from one source or the other during the course of operations. That’s critical information for drillers trying to make the best use of each well. Right now, if a company drills two wells, one targeting the Bone Spring, the other the Wolfcamp, it is challenged to know for sure if those wells are drawing from their intended targets. Both wells could be sucking oil from, say, the Bone Spring, depleting that source more quickly while missing out on the crude from the Wolfcamp. Biota CEO Ajay Kshatriya, a chemical engineer who grew up in Katy and spent much of his career in California’s biotech industry, compares oilfield acreage to a six-pack of soda, each can a distinct formation or reservoir. The producer aims to place one straw in each can, but sometimes, two straws wind up in the same can, doubling the company’s cost to produce what could have been done with one. And there’s the chance that some cans will remain unopened, leaving profits underground. For all of their advanced technology — seismic imaging, computer models and production monitors — energy companies still can’t be certain where oil and gas is coming from once the shale rock is shattered through hydraulic fracturing, or fracking. It’s like throwing a rock at a window; even with perfect planning and aim, the cracks will zig-zag unpredictably in any direction. It becomes even more unpredictable thousands of feet below ground. That’s where the bacteria, among the earth’s oldest organisms, come in. Over the eons, the bacteria adapted to particular conditions underground, diversifying genetically into different strains depending on heat, pressure and other conditions in the mishmash of prehistoric sediment overlapping in different formations. In other words, the strains of bacteria in the Wolfcamp have a different genetic makeups than those in the Bone Spring. Biota, which has offices in California and Houston, uses DNA sequencing, computer algorithms and a proprietary database to identify the strains of bacteria that come up through oil and gas wells and maps those microbes to their respective formations based on where the samples were taken. Drawing on more than 20,000 samples from some 500 wells in the Permian and nine other basins, Biota has analyzed more than 400 million DNA sequences from the nation’s most prolific production areas, and recently began working with offshore customers in the Gulf of Mexico and Asia. As the map becomes more extensive and detailed, oil and gas companies would be able to confirm the source of crude — and adjust operations as needed — with information about the bacteria produced from the well. It’s another tool for an industry than can no longer count on $100 a barrel oil to cover cost overruns, especially as investors increase pressure to keep a lid on costs and boost profits. Marathon Oil and EP Energy of Houston and Anadarko Petroleum of The Woodlands have signed on with Biota, as have Norway’s Equinor and Australia’s BHP Billiton, among others. Recently, Midland’s Concho Resources, Pennsylvania’s EQT Resources and Malaysia’s Petronas joined the customer roster. John Gibson, chairman of energy technology at Houston energy investment bank Tudor Pickering Holt & Co., has worked for the past year to connect Biota with the bank’s oil and gas clients, extolling the insights expected to come when the company has analyzed enough bacterial DNA to map wide production areas. The bank has not invested in Biota. For oil and gas companies, the data has the potential to show far more than how a single well performs once it’s fracked. Data from multiple wells could determine how they interact and help producers find the optimal number of wells to develop a reservoir. And it could enable them to monitor production over time — a well that starts off siphoning oil from the Wolfcamp, for example, could, at some point, begin to draw from a different formation. Anadarko was one of the first companies to conduct a large-scale pilot program with Biota last January, starting with a study of 33 wells in the Delaware region of the Permian. It has since expanded the study to include more than 100 wells there in pursuit of a broader data set that could help it enhance its drilling models and more quickly determine the most efficient means of achieving production targets. Blunt, K. (2018). Bacteria lead the way to more efficient oil production. [online] HoustonChronicle.com. Available at: https://www.houstonchronicle.com/business/energy/article/Bacteria-leads-the-way-to-more-efficient-oil-13178180.php [Accessed 6 Sep. 2018]. A Houston native, Janeen Judah was one of the few women to take up petroleum engineering in the 1970s. Fast forward, 40 years and she’s retiring this month as an executive at Chevron and as the president of the Society of Petroleum Engineers. She’s leaving her position as the general manager of Chevron’s Southern Africa business. She’ll keep serving as a new board member for Houston drilling and fracking firm Patterson-UTI Energy, but Judah also wants to encourage more girls and young women to enter the so-called STEM fields — science, technology, engineering and math — that too-often remain male-dominated. Q: What made you interested in the energy sector, and petroleum engineering in particular? A: My dad was in the midstream (energy) business. He was and is an engineer. I’ve found that a lot of women who went into engineering in that first wave in the ’70s — a lot of them are either daughters or younger sisters of engineers. It was not something you kind of picked out of the sky normally as a major. I was always a problem solver, and that was really what appealed to me about engineering — the analytical side of it. And I was fascinated by the oil business. You grow up in Houston back then and it was very prevalent and a very fascinating wildcatter kind of business. There was no doubt I wanted to go work in the oil industry. Q: You earned bachelor’s and master’s degrees in petroleum engineering from Texas A&M University. What was the experience and culture like then? A: Back then, in the late 70s, only about 10 percent of the engineering students were women. It was pretty thin as far as how many women were there. There are some who stuck with it for an entire career, but I’d say probably about half of them ended up laid off in the ’80s or made a choice to stay home. From about ’86 until almost the late ’90s, there were layoffs every year or two at most companies. A lot of them left the industry. Q: You worked with ARCO before joining Texaco and then Chevron. How was it starting your career in Midland with small companies and then ARCO? A: I used to always have to explain where the Permian Basin was to people, and nobody asks that question anymore. I lived out there during the ’80s. It was tough times for all of my early career. Q: Was it particularly tough as a woman? A: When I first went there it was still the boom and women were extremely unusual in the business. When you went out in the field it was like an event. You were rare and unusual. When I had my first interview out there it was at the old Midland Petroleum Club and women were still not allowed to be members. They had to get special permission for me to eat. That’s the way it was in 1980. Now, it’s much more common to see women. But, back then, you were highly unusual. Almost every industry is male dominated. Energy is maybe a little more macho industry, or maybe more aggressively male than some other places. A: It would generally open like, ‘What’s a women doing here?’ kind of thing. But it wasn’t that common. They knew you were there to do a job and they let you do it. I never experienced anything that was too egregious. It’s a good-paying job, and you work in the field, and you have to be a little tough. And, often as an engineer, you’re the one in charge, so you had to be authoritative. If you were a female rig supervisor, they’ll call you the company man. That’s just the job title. Q: Is it frustrating to be singled out as a female leader or do you welcome the role model position? A: Generally, we all want to be treated equally and fairly in our workplace — to just be treated as most of the guys. But we realize — at least I realized —that after a certain point you are an example. You have a duty and an obligation to be visible and to step up and help coach, mentor and give advice to the women who are following you. A lot of us have started doing that. I want to try to make the path easier for others, because mine was hard. Q: What’s your point of focus? A: I personally tend to target mentoring the mid-career technical women. There’s not many like me who are late career with technical backgrounds. I can help with those hard decisions that a lot of women generally make in their mid-30s. I always get asked about work-life balance. I tell them I don’t really believe in a work-life balance; it’s more work-life compromise. Social media doesn’t help where people think everything can be perfect with Instagram and Pinterest. That’s just unrealistic. I don’t know anyone who had it all at the same time. Some things come off the table at certain phases in your life. There are compromises and decisions. If if you have a family and there’s another career involved, then there’s decisions you need to make as a family. I think a lot of women have an unrealistic expectation that there’s some kind of magical balance you can get. Q: What do you tell them? A: I talk a lot about perseverance. A lot of women are socialized differently. Little boys, especially through sports, if they get knocked down it’s OK. There’s no broken bones, dust them off, put them back in the game. They’re socialized to not quit and to persevere. I think a lot of girls — it’s, oh, you fell down, sit over here. We socialize that it’s OK to withdraw. I coach mid-career women when they’re facing setbacks or problems to stay in the game. Q: So it happens from an early age? A: A lot of girls are discouraged, particularly in high school, from going into engineering by their parents or by school counselors. I don’t think it’s held up as being a good career choice for a girl. They tend to think the boys will be mean and you’ll have to go work out on a construction site or whatever. And you don’t. A lot of what we do is computer based and in an office. If someone’s majoring in environmental policy I ask why did they pick that? If they want to save the planet, why didn’t they go into environmental engineering? They could actually do something to save the planet. A lot of the grand challenges of society are engineering problems – clean air, clean water, clean energy, pollution. I don’t want to scare them off. I want to encourage them to stick with STEM. It makes so many career options open up for girls. was not something you kind of picked out of the sky normally as a major. I was always a problem solver, and that was really what appealed to me about engineering — the analytical side of it. And I was fascinated by the oil business. You grow up in Houston back then and it was very prevalent and a very fascinating wildcatter kind of business. There was no doubt I wanted to go work in the oil industry. Oil gets a bad rap these days, but the stuff is actually quite incredible. Today’s infographic comes from JWN Energy, an oil and gas news site. Using Chevron as a source, it shows 17 different things that can be made from each barrel of oil. 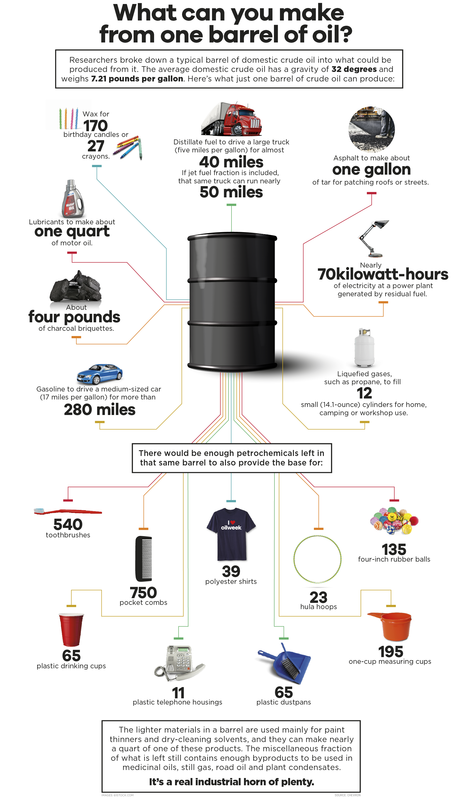 Enough gasoline to drive a medium-sized car over 450km (280 miles). Enough distillate fuel to drive a large truck for almost 65km (40 miles). If jet fuel fraction is included, that same truck can run nearly 80km (50 miles). About 1.8 kg (4 lbs) of charcoal briquettes. Enough propane to fill 12 small (14.1 ounce) cylinders for home, camping or workshop use. Asphalt to make about 3.8 L (one gallon) of tar for patching roofs or streets. Lubricants to make about a 0.95 L (one quart) of motor oil. Making gelatin is fun, and it certainly is delicious. But fracturing gelatin from the inside is a cracking good time. Hydraulic fracturing was one of the experiments conducted by the SPE Calgary Section during a recent school visit. About 60 students participated in a range of Energy4me activities where they learned concepts such as porosity and perforated well casings in addition to hydraulic fracturing. Dispelling many of the myths about this form of hydrocarbon production, SPE members explained to students about the technical aspects that are involved in the process, and why it is one of the most regulated and safest forms of hydrocarbon production. The Society of Petroleum Engineers provides good information on hydraulic fracturing on the Energy4me website. Through Energy4me’s hands-on activities, the students also saw first-hand the results of core sampling on different sub-surface terrains. The SPE members offered instruction on why it is important to use science when investigating what is beneath the surface during hydrocarbon exploration. From porosity to perforated well casing, students left with a better understanding of the various steps that go into exploration and production. Globally, Energy4me excites students about the oil and gas industry. Through its award-winning program, Energy4me teaches students that engineers are investigators and problem solvers, often leading to new technologies and innovations for the world’s energy needs. It pays to have the right tool. That’s the lesson high school students in San Antonio, Texas, learned during an Energy4me workshop. Nearly 100 students competed in the hands-on activity, which challenges them to produce and refine the most amount of oil in the quickest time with the least (or no) amount of spillage or other complications. During the activit y, students can purchase or exchange various tools that represent advancing technologies in oil and gas exploration. In one game, they learn about exploration, project management and negotiating. “I loved the peak oil game because it taught me the importance of having the right equipment and right team when doing a task,” one student said. The Society of Petroleum Engineers conducts Energy4me workshops and presentations all over the world. Through extensive use of hands-on activities, this innovating program, working in conjunction with the NEED project, encourages students to study engineering. In particular, the peak oil game teaches students the value of exploring for and producing hydrocarbons. Studies prove that hands-on activities create connections between the classroom and real-world situations. This style of teaching also nurtures critical thinking and problem-solving skills, which are traits that many employers value. After completing the activity portion of the workshop, students were then treated to a tour of the exhibition floor where they see all of the technology they just learned. The tour is a true highlight of the workshop and the only way that students can access an SPE exhibit floor. At the same time, the students were learning about oil and gas, 20 science teachers took part in a separate workshop. Energy4me believes that if we educate a teacher, we educate generations of aspiring engineers. Teachers receive a free digital version of the Energy4me teacher kit, which includes many resources that they can take back to the classroom. Teachers also get an exhibition tour. Have you ever seen the beginning of oil? About 360 students in Kuwait did recently, thanks to the Energy4me workshop they attended during the Kuwait Oil & Gas Show. Walking into the Ahmad Al Jaber Exhibition Center, these students along with 60 teachers were thrilled to see one of the world’s largest curved screens, which gives visitors a glimpse of the industry in Kuwait. The building was designed to look and have the shape of the shell of an extinct marine animal called the ammonite, which lived some 120 million years ago and is thought by scientists to have contributed to the formation of today’s oil reserves. The Energy4me team took participants on a journey of exploration and production. In the fun and educational workshops, teachers and students learned how humans first discovered oil as they worked through the “natural oil seep” experiment. Next, they investigated seismic technology to see what is beneath the surface; to do that test, the groups used the “sound wave” experiment with Slinkys and Styrofoam cups. These hands-on activities do so much to help us understand the basic scientific concepts that are dealt with within the industry, but more than that, they help give us an understanding on how to engage with students in the classroom in a fun and easy way,” said one science teacher from the Canadian Bilingual School. Teachers and students then learned about the value of a core sample in understanding the concepts of pressure, porosity, permeability and density in helping scientists make a decision about where to produce energy. The resources offered by the Energy4me program are designed to help make these concepts more accessible to the public to increase awareness and understanding. The journey ended with the “perforated well casing” activity, which teaches the concept that perforations help us extract more oil and natural gas, and the “getting the oil out” activity, which always sparks a fierce but friendly team competition to see who can get the oil out of the ground. Only, in this experiment, chocolate syrup and cola take the place of oil (one being more viscous than the other). The workshops show teachers the value of using hands-on activities to encourage students to pursue STEM-related subjects in school and at university. The aim for the students was to highlight some of the exciting aspects of being an engineer and to help give them a better idea of what to expect should they choose to pursue an engineering career. All of our experiments are freely downloadable via the Energy4me website and the materials that are needed were designed to be easily accessible in any part of the world so that anyone would be able to use our resources to help educate the public. Aberdeen, we have an astronaut! That wasn’t exactly the introduction as retired NASA astronaut Rick Hieb visited the Scottish city recently to educate local teachers on science and space exploration. But, it was accurate! Hieb was joined by NASA space scientist Sue Lederer and Hyang Lloyd, president and co-founder of the Scottish Space School Foundation USA. The trio visited Aberdeen as part of the NASA in Aberdeen 2017 project, participating in a range of scientific events catering to students from primary and secondary schools plus families visiting Aberdeen Science Centre. This initiative was jointly organized by the Society of Petroleum Engineers, the Energy Institute and Society of Underwater Technology. The NASA in Aberdeen project seeks to inspire the next generation of engineers, said SPE member and Energy4me advocate Colin Black, who also serves as chairman of the NASA in Aberdeen project. The program offered educational lessons to teachers on topics such as staying safe in space and returning to Earth. The teachers said that not only were the resources to be useful and enjoyable but that they also plan to use what they’ve learned in their classrooms, teach their students even more about space travel and its relation to other industries. From left to right, Colin Black, Dr Sue Lederer, Hyang Lloyd and Rick Hieb.